Rhythm and relaxation create an endless information loop that is the basis of everything else we do with our horses, either as trainers or riders. You need both to communicate clearly with your horse and you cannot have one without the other. Think about how this combination feels in your body as you ride. Relaxation makes it easier to set rhythm, and rhythm makes it easier to relax. On the flip side, tension in either horse or rider disrupts rhythm. Our responsibility as riders and trainers is to learn to lead this dance rather than merely following along with whatever the horse offers. In the beginning, riders start out on reliable, goldie oldie school horses that offer a predictable ride so the rider can relax as she learns to balance over the horse's center of gravity, apply aids, and eventually coordinate those aids into horse-logical corridors of pressure using an independent seat. Leading the dance means that a relaxed rider with an independent seat can set the working rhythm for any horse, young or old, green or grand prix, mellow or nervous. And that rhythm helps create relaxation in the horse and there we are at the best starting point for everything else we do with the horse. Even though rhythm and relaxation are a bit of a chicken and egg conundrum, rhythm is at the base of the training tree because that is our point of entry as leaders in the partnership with our horse. Working from the ground, our rhythmic movement sets the patterns and feelings of shapes that become familiar to the horse. This familiarity helps the horse relax. He knows what to expect. When we ask a green horse for these familiar patterns and shapes under saddle for the first time, their familiarity helps the horse assimilate the new feeling of someone on his back. Later on in his training, as we begin asking the horse to push from his hindquarters with greater energy into our guiding hand, rhythmic patterning helps him work with elastic, 'relaxed', muscular tension rather than with tight, bunchy muscles. Simple daily routines on the ground are the start of a rhythmic relationship with your horse. Greet your horse, halter him, and groom him following the same routine each day. Become aware of working with your horse rhythmically as you speak, breathe, touch and move around him. Type A personalities find this very difficult and must train themselves to become rhythmic. Rhythmic movement makes you a predictable presence and, as your horse finds he can depend on you as that predictable presence, he will find it relaxing to be around you. 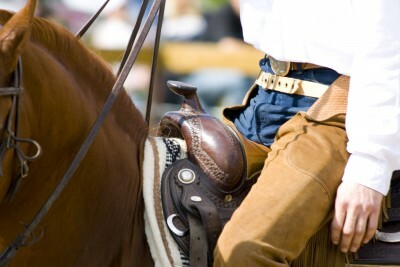 Then you can carry that rhythmic, relaxed rapport over to your work under saddle. The more nervous or reactive your horse, the more important it is to build this relationship through groundwork before you saddle up and ride. Continue using routine, especially with a young or nervous horse, when you start working him under saddle. Move the horse from the stall to the arena in a consistent way. Take him for a walk around the arena each time to check things out, paying full attention to your horse, and setting a rhythm as you walk, turn, check your girth and mount. If you are slouching in a chair seat with your leg out in front of your seat bones a bit, you will fall behind the horse's motion, encourage him to scoot or run, and interrupt his rhythm. If you are collapsed in your mid-section or tilting your head and shoulders forward, you will be ahead of his motion, blocking good rhythm. With your upper body centered over the horse's center of gravity and firm core muscles, check whether your back, buttock and thigh muscles are completely relaxed so they can follow the horse's motion easily or whether they are holding any tension that will interrupt a rhythmic seat that moves with the horse. Trying to slow a horse down by limiting the range of your hip motion does not work. Opening and closing your hips less than your horse is opening and closing his joints puts you behind the horse's motion. This creates a pushing feeling that makes a horse, especially a tense horse, scoot faster. While following the horse's motion, you need to open and close your hip angles the same amount but more slowly to slow him down. It takes a lot of saddle time for riders to progress from sitting with rhythm and relaxation on the back of a goldie oldie to confidently setting the rhythm on a green, nervous youngster or a green, lazy youngster. Finding someone to longe you regularly on a rhythmic horse helps immensely to develop the correct feel for rhythmic motion and relaxed muscles. Challenge your ability to set the rhythm for the horse by riding different horses - different size horses with different gaits and different temperaments. Always keep in mind that rhythm is the mother of all the other training skills your horse must master. So when your ride starts going badly, rhythm is the 'reset button' you can use to put things right again. Your turn! Let us know your tips for establishing rhythm in the comments below. I will never forget Meredith Manor. If you want to see if you're up to a life with horses, go there. I learned so much there in a short amount of time. I'm still riding & teaching, and am barn manager at a small place. We have about 20 horses. I cannot imagine a life without horses.